The car air fresheners market in North America depicts a competitive and highly consolidated market, reports Transparency Market Research (TMR). Major players in the market accounted for nearly 60% of the total market share recently, adds TMR. Some of the main companies operating in the car air fresheners market are S.C. Johnson & Son, Inc., Procter & Gamble Co., Handstands, Reckitt Benckiser Group Plc, and CAR-FRESHNERS Corporation. Main players in the car air fresheners market are investing in innovation to introduce new products in the market. The development is likely to continue as online channels allow market players to reach newer and far younger customers. Key players in the car air fresheners market are expected to aggressively sell products through mass retail stores and automotive shops as economy registers a notable recovery from the recent economic slowdown. The marketing strategy is likely to shift towards online retailers as data analytics provide more insight into new group of consumers. 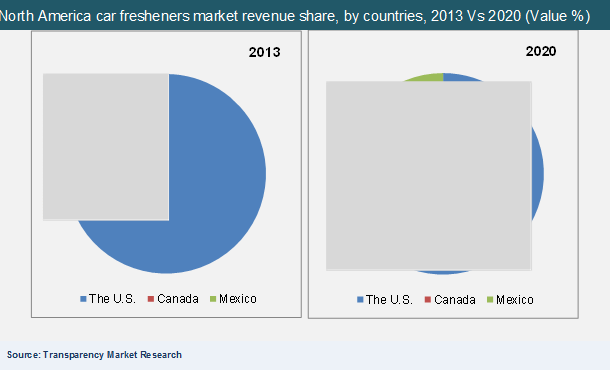 The car fresheners market in North America reached USD 744.5 mn in evaluation in 2013. The market is anticipated to touch $952.01 mn by 2020 end, rising at a CAGR of 3.65% during 2014-2020. Canada is expected to register the fastest growth in the region, followed by US. Canada is likely to grow at the fastest rate, followed by the U.S. the growing awareness about aromatherapy and its health benefits are expected to drive growth of the car air fresheners market in the near future. Consumers in the North America region, especially from the US share a very special relationship with their vehicles. Due to long commutes for work, emphasis on individual identity, and due to the country’s status as a pioneer in auto manufacturing, vehicles are revered personal possession for many Americans. Consequently, keeping vehicles in healthy conditions with proper maintenance is necessary and important for many consumers. This has driven the growth of the car air fresheners market in the region. However, recent recession and slowing car sales due to renting trends present major concerns for the car air fresheners market. Additionally, growing concern about chemicals used in air fresheners are further likely to limit growth of the car air fresheners market. On the other hand, natural air fresheners are witnessing a rise in demand, thanks to innovation in these fragrances and increasing demand by consumers. Additionally, consumers in the region are willing to pay an additional premium to purchase quality fragrances, which is a positive sign for the future of the car air fresheners market. An age old challenge in the car air freshener market in North America is the changing consumer preferences. Due to significant differences in climatic conditions, highly individualized preferences, and increasing regulatory scrutiny of air fresheners are making it difficult to predict consumer preferences. However, large number of consumers prefer the same fresheners they use for homes in their cars. This is forcing manufacturers to focus on new natural fragrances, enhancing product quality and increased promotions to gain consumer loyalty. Hence, the car air fresheners market is witnessing increase in sales of air fresheners as a gift item. Its important application and endearing nature of the product for many US consumers is expected to drive healthy growth for the car air fresheners market in the near future.